What’s Your Home REALLY Worth? or Beat Out By Other Buyers? 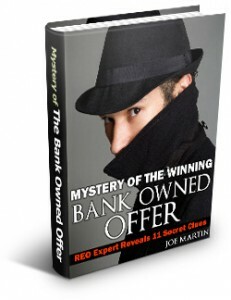 Thanks a Million for picking up your copy of “Mystery of the Winning Bank Owned Offer”. My name is Joe Martin and I’m excited to share what I’ve learned from my experience in selling over 1600 bank owned homes since 2008 and processing literally thousands of bank owned offers. I will be pulling back the curtains and exposing many of the insider strategies, tips and secrets used by the savviest of investors and real estate buyers being used to procure millions of dollars of bank owned homes. The top 11 clues you’ll need to solve the mystery of the winning bank owned offer will be revealed inside, even ones you can use to win the most competitive of bidding wars. I’m a seasoned veteran real estate broker who is in the trenches daily who has worked as the designated broker/owner of a top RE/MAX office and currently am an associate broker at HomeSmart in Mesa, Arizona. The team I led was ranked in the Top 100 RE/MAX Teams in the World in 2009 and 2011, an amazing feat only accomplished from a collective effort of excellent agents and staff. I was ranked #27 in the 2012 Wall Street Journal’s list of the Top 1000 Real Estate professionals in the U.S and was also honored by Phoenix Business Journal, a highly respected local magazine in the #7 slot of the Top 10 Real Estate Agents in Phoenix. I’m a national REO trainer and columnist, a published author and a State certified real estate instructor, just to name a few off my lengthy list of accolades and designations. I have trained multiple agents (and buyers) on these methods to help them successfully get their offer accepted the first time in or to win the dreaded bidding war. Fact is, many agents (and buyers) give up prematurely when they hear there are “multiple offers” on the property they’re attempting to buy. You will see inside what a huge mistake that can be and how one agent and buyer nearly walked away from their initial winning offer. 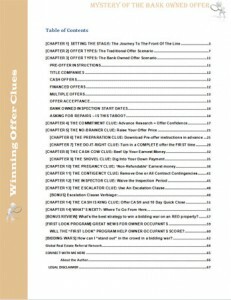 Frankly, I’m thrilled to share this valuable “real life” information I’m sure will help you better understand how to structure a winning offer right out of the chute and eliminate the frustration and disappointment of a rejected offer. 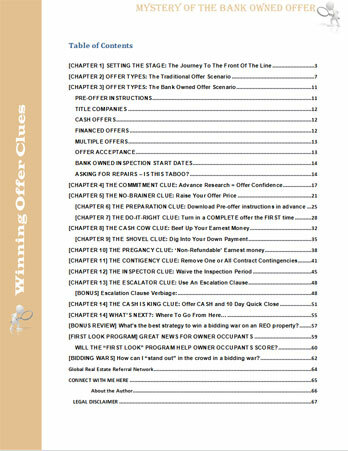 We’re about to solve the mystery and learn the hidden clues (tips and strategies) you can implement to help give your offer the best opportunity to make it to the front of the line in any market you choose to purchase in. When you’re done reading this guide, you’re going to be able to structure your bank owned offer to have a distinct competitive edge and the best chance of actually getting your offer accepted ahead of other buyers. Phoenix Home Values: Why people are lining up to buy your Phoenix home! Mortgage Forgiveness Debt Relief Act Will Cost Sellers $1000′s!